I love history.Â For me, it is often all about the trivial parts we often don’t hear about.Â It’s partly because it’s all about learning something new.Â Yet there is also something which feels a little conspiratorial about knowing something most people don’t.Â It’s a strange and ultimately nerdy type of fun.Â Now here’s a chance for you to see what that feels like for me. Starting this May 20th, now available on DVD from Jerry Bruckheimer Films and Walt Disney Studios Home Entertainment comes the latest chapter in a tale of history and fun.Â National Treasure 2 â€“ Book Of Secrets is now available to bring home and help your children learn about the interesting nooks and crannies in the past of America.Â Allow them to begin enjoying their learning today! This movie follows the first National Treasure adventure film.Â Riley and Ben Gates still occasionally see each other and life has generally moved on.Â But a mysterious man reveals a document stating that Ben Gates’ ancestor was involved in the assassination of President Lincoln, rightfully enraging the Gates family.Â Ben is convinced that it is a code, so he rushes off to follow the clues and is trailed by the mystery man.Â Clues lead to more to buy propecia clues and so on into the ether and it all wraps up in a meaningful and quite surprising way. There are more special features included in this two disc special edition collector’s DVD boxed set than actual movie footage and that’s nothing but a great thing.Â The special features included are an optional audio commentary with director Jon Turteltaub and actor Jon Voight, a selection of deleted scenes, a reel of bloopers and outtakes, and featurettes about making the sequel, filming of the locations of each shoot, how they made the car chase through London, a look into the Library of Congress, and several ones about the Golden City. I was surprised at how much I enjoyed this movie.Â The first one was somewhat of a guilty pleasure and I anticipated that this film would simply be a worst version of the same sort of thing.Â Yet the sequel was much more human, with flawed characters and a tone which was decidedly darker.Â It was the same mix of relics, historical trivia and far-fetched schemes, but it was a story which stood a greater chance of resonating in a realistic manner. This Secret deserves to be told. 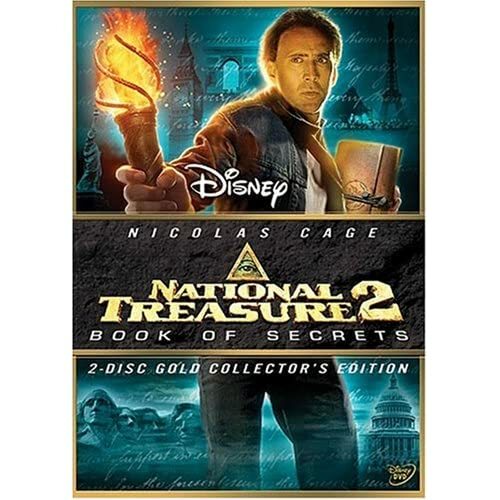 No user commented in " Movie Review: National Treasure 2 â€“ Book Of Secrets "